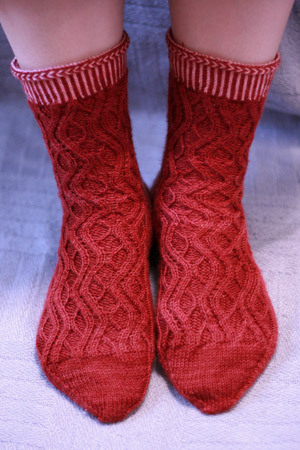 Pattern: Scala Socks by Stephanie van der Linden. November 2006 knitalong selection of the German Yahoo group Socken-Kreativ-Liste. Yarn: Lorna’s Laces Shepherd Sock in cranberry (45ns, 2 skeins) and peach (10ns, 1 skein), from Linda’s store. I tweaked the pattern a little to make sure the cuff wasn’t too tight, and that there was plenty of room for my pal’s ankles. To make the two socks mirror images of each other, I reversed the direction of the decorative edging as well as the path of the cables. I also decided to continue the cable pattern on the instep, instead of knitting it plain. Speaking of cables, there are a good number of them in this pattern. Do you know how to cable without a cable needle? It’s a wonderful timesaver, I highly recommend it! This is how I do it, and there are a ton of other tutorials, too! Oooh, those are gorgeous! Thanks for the links to all of the no-cable-needle tutorials. When I needed to use the technique, I was without a computer, and kind of unvented it. It’ll be nice to try some new methods! Is it too late for ME to be your pal? Your socks are making me drool. they’re awesome! i love the latvian braid and corrugated ribbing. your pal will cherish them! I wish I was your pal!!! Those socks are fantastic – is there any way to get the pattern without retroactively joining the Yahoo group? Is it in their archives? They look fabulous! Continuing down the instep was a good idea. Those are beautiful socks. You will have one lucky pal! Are you excited to see your socks from Sockapalooza? It won’t be long…. Oh my gosh, these socks are awesome. Lucky, lucky sock pal. Oh my they are beautiful! I want some! Wow, your sockpal will love those socks, they’re gorgeous! Gorgeous, as always. Your sock pal is going to faint with happiness. They probably already did when they found out they had you as a pal! Those are some rockin’ socks! Very very nice! Your pal will be thrilled. Wow, those are absolutely beautiful! What a lucky sock pal you have! GORGEOUS! gee, i hope i’m your pal! They look really great. I love how you reversed the patterns – it’s so Grumperina of you! Bravo! Your work is beautiful. I admire the way you do not settle for ‘good enough’, you take it all the way to perfection. But your tutorial is the best. I’ve been cabling without a cable needle ever since I first saw your tutorial (in the middle of an all-over cabled sweater in a size 50″ chest). I’ve recommended it to lots of people and linked to it a couple of times because it is, in fact, the best. Thanks again. Absolutely great. I would not have expected anything less but reversing the pattern for the second sock. After all, I do it and I am not nearly a perfectionist as you are (yet)! Love those socks – they look fabulous! thank you! I’ll take them. my color, size and I love cables………. Those are awesome socks. If I were in a Sockapalooza thing and discovered YOU were my pal, I would swoon right then and there for sheer joy. But since I don’t join those things b/c I am too independent/stubborn/lame to knit on a schedule I am doomed to wear only socks made by my own two hands. Is there an English translation of that sock pattern? Your socks are absolutely stunning! I’m so envious of your Sockapalooza pall! If I were to own a pair of socks as wonderful they would never leave my feet! And yes, does the pattern come in English? Beautiful socks! You have a very lucky sock pal. Wow! Those socks are great! those are the most beautiful socks i’ve ever seen-and i love that they’re red! lucky sock pal! Those socks are gorgeous. What a lucky sock pal! firstly, the socks? can i have them? you still have time to make different ones for your pal. 🙂 secondly, your tutorial has kept me sane with my latest cable project, so thanks! Those are awesome. Oh, how I hope I’m your pal!! The socks are really gorgeous! Well done. And it’s because of you, that I knit cables without a separate needle. I really love it, it’s so easy after a while. Know it makes much more fun to knit patterns with many cables. They look so lovely! Your sock pal is definately lucky. I think you made an excellent choice extending the cable pattern. They look lovely. And I’m sure your sock pal will appreciate you putting in so much consideration to reverse the cable and color patterns. I do hope, that I might be as lucky as to be the receiver of those toooooo beautiful socks! They are truly stunning!!! Beautiful color, beautiful pattern and stunning finish (good knitting!). Those are just fabulous. I’m not sure I’ve seen that pattern before, so thanks for the link. Lovely job, as usual. Wow! They’re gorgeous, and continuing the cables was a stroke of genius. I also applaud the mirror imaging. It’s just always a cool thing to do! Wow! Color me impressed! You knit some amazing socks! Wowwowwow – amazing!! Love the contrasty bits & the cabley bits. They are awesome! What marvelous socks! I love the peppermint candy stripes, and especially the Latvian braid. Yum. Must resist the urge to cast on a new pair of socks when there are so many mateless ones languishing sadly in my drawer. If the SSS goes on much longer I may start wearing them mismatched. I so wish I had participated in Sockapalooza this year. Those are really beautiful socks. Thanks for the heads up on the cabling tutorial – I had no idea about this. Will definitely try it. Oh my, I kinda hope those will be on the way to me soon…. Those are great socks! I wish I were your pal, but sadly I’m not even participating. Lovely socks! What a lucky pal you have! They are beautiful, as always. It makes me reconsider buying some cranberry LL I recently saw at a LYS…. Wow…great socks. Make me feel more than a little inadequate, but I am knitting Jaywalkers for my pal. Thanks for the great pattern. You have a LUCKY sockpal! I am speechless – the socks are to die for! Love the way you finished off the cuff! Fantastic job! Wow the socks are awesome! Your pal is soooo lucky. I totally dig the mods you’ve done with the socks. And the color’s awesome too! So pretty! I can’t quite get the hang of cabling without a cable needle. Oh I get the *concept*, but my hands can’t make it happen. Maybe if I tried it at home, instead of on a moving train it might help…. Beautiful socks, and I wanted to delurk to tell you thanks for the KnitScene article on beading – I just signed up for Mystery Stole 3, but never beaded before, after reading your article, I feel confident I can do it. Uh, wow. I’m such a fan of those heels. And the entire sock, but those heels…. OK, I love those socks so much that I joined the Socken-Kreativ-Liste even though I hardly know any German because I want the pattern so badly. But, I can’t seem to find the patter on the SKL. Help? Direction? My high school German is rusty, and the Mac Translation widget only goes so far. THANK YOU IN ADVANCE because those are AMAZING socks! Anna, THANK YOU! You rock! Monatsmuster translates to “Monthly Sample” using my translator widget. No wonder I couldn’t find it. (Must learn German. Again.) Thanks! Wow. And WOW. Those are crazy great socks! I am jealous. I think I’ll pout now. Uh Oh. Another sock pattern that now, I won’t be able to stop thinking about. Am I already a member of that group? Hmmm… I’d better check. They are gorgeous. I wish you were my pal, but I’m thinking that since you actually know me you would have knit me some blue socks. Sigh. I think these are my favorite socks that you’ve made! Love the cuff and ankle details on those. Lucky sock pal! Those are really nifty socks! I love how you made them mirror images, lucky lucky sock pal! those are really lovely. and different. nicely done as always. your Sock pal is so fortunate! you’re an inspiration. Wow. I want that pattern! How’s my German, good thing I’ve got Babel Fish! I want these. Let’s hope I’m your sock pal, or there’s going to be a problem. The problem: me having to ditch all of my other single socks for knitting some for myself. They are gorgeous! Totally diggin’ these – so cute! I’d love to knit these socks, but my German isn’t quite up to a knitting pattern. Is there an English translation of the pattern available?